Kitchens should be designed so you have adequate space to move around and do things efficiently. A comfortable kitchen should have minimum of 100 square feet of floor space. The moving space should be planned around what are called "work triangles". That is, triangular space created by drawing a line from the center of each of the three major work areas, food storage/refrigerator, food preparation/cooking, and clean-up center (sink). When a work triangle is planned the recommended distances are - sink to refrigerator four to seven feet, sink to range four to six feet, range to refrigerator four to nine feet. Total distances along the triangle should not exceed twenty two feet. Normal work patterns are from the refrigerator to the sink to the range, in a counter clockwise direction. Also, along any wall no two appliances should be closer than four feet measured from the center front of each appliance. 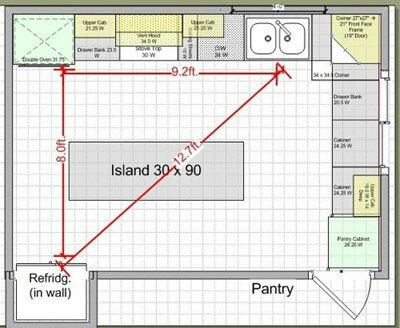 If an one wall kitchen is planned, it should not exceed twenty two feet in length; otherwise, distances between appliances become too great for efficiency. 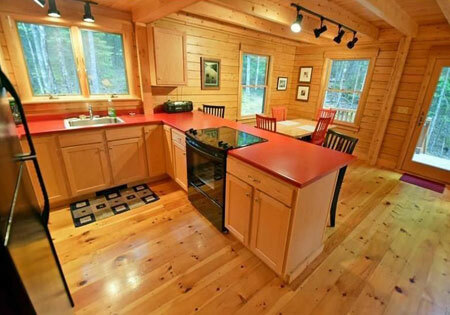 Ready to take the step and build your log home, hybrid or timber home? View our floor plans and contact us today at 800-341-1566 or drop us an email. Your comment has been submitted. It will be posted to this article pending approval.